Air Maui just did an excellent job with this tour of the cliffs of Molokai and West Maui mountains. Shoutouts to Minoaka and pilot Troy. This was my first helicopter experience and I was surprised at the smoothness and incredible visibility. This tour went over terrain pretty much impossible to see any other way. Hard to describe what it's like to approach a waterfall going down a cliff 1,000ft. to the sea and getting close and personal. 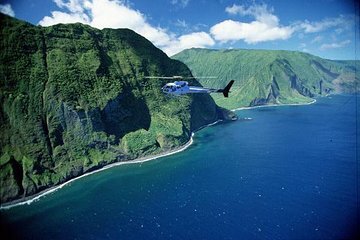 The other great thing about the helicopter is that if you have driven or hiked in West Maui, it is really helpful and beautiful to be 1,000 feet in the air looking down so you can see how everything fits together. Definitely high value. Fantastic and very amazing . Our pilot was very informative and very experienced . Overall a very great flight over Maui and surrounds . Highly recommend this tour . Captain Kirk gave information about the islands as we passed over them. A great flight up the canyon on Molokai and all the memories on a USB drive to relive when we are back home. Fantastic! Even with a light rain falling at time the views were incredible. The pilot made sure to re-position the helicopter so that passengers on both sides were able to get a great view. Amazing experience. 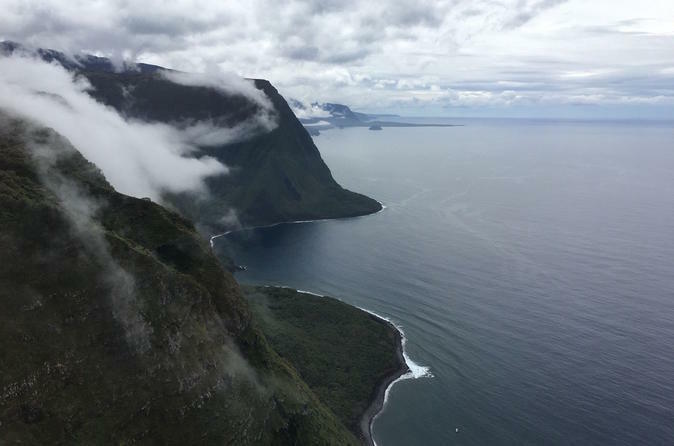 Troy was a great pilot and guide and gave us some unforgettable, up close and personal views of Molokai and all of its splendor. While viewing it's largest waterfall, he made some deft maneuvers, which had us all a little white knuckled, as he inched closer and closer to provide us with the best shots possible. Just an incredible overall experience by the provider, Air Maui!. Unfortunately, the video of the day was corrupt and could not be recovered when we tried purchasing it, but I think we captured enough photos to memorialize this amazing venture. Our family of 5 did this tour, and it was the highlight of our Maui vacation. It was breathtaking an we would all love to do it again in a heartbeat. It is a lot of money, but it's just unparalleled. We have some members of our group that were apprehensive about flying in a helicopter, but they had no problem. Now they want to go on a helicopter tour on every vacation. How does one describe a helicopter ride? Let's just say that it was AMAZING! The views were phenomenaly breathtaking. The tour operator was very friendly and gave us a great history of the island. Would I recommend this tour? The answer is an absolute YES. This is the best way to view the island. Cap'n Kirk great name for a pilot! was awesome. Had a great tour of Molikoi and the famous Jurassic Park area. Scenery was unbelievable. One of our favorite activities on Maui. Air Maui was great . Awesome staff - very warm and cheerful. The pilot Jessie was informative and had a great sense of humor. Before boarding the helicopter, we had photo-ops you, or your party, and the helicopter in the background with the pilot seated inside which were available for purchase, along with a recording of the flight views from the flight interspersed with views of the riders. Much cheaper if you pay with cash. Amazing views! If you have motion sickness like me, take the maximum dose.They try to balance the weight distribution and keep pairs together so the lightest people don't always sit up front, but they will get the window seat. First class from the moment you arrive to the time you leave. Captain Kirk is an outstanding and professional pilot with a knack for sharing the islands with mainlanders. Thanks to all at Air Maui!